Well, I had placed an order for some postcards I have been working on. They shipped (yea) and were to be here last week. But this tale has a bit of a twist. Seems my postcards wanted to travel the US courtesy of the Postal Service and UPS. There are some companies that utilize UPS as a hand off to the local post offices. Here is the travel itinerary of my PCs. So on October 21, UPS handed off my package to the Postal Service. So far so good. Even made it about 3 miles from my house. 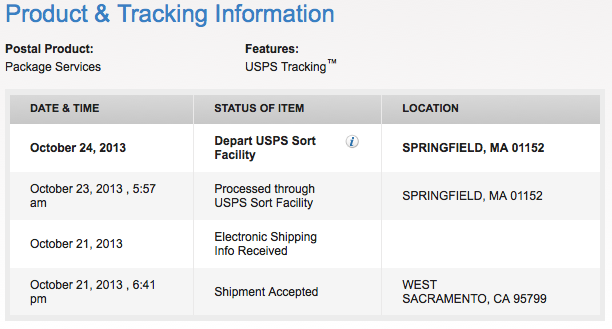 And then the Post Office sends it to Stockton (why?) and then to Springfield, MA. HUH?? So to date I still have not received my postcards and have a lovely track record of their journey. Anyone else have some tracks of odd journeys?? Great way to travel on budget! As of today (Nov 4) still not here. Do you make your own postcards?